1. The lay of the land. I’m convinced that ghosts like a good view, so for the sake of the ghosts who may in fact be hanging around, there’s nothing better than a cemetery that is either set on a hill, or at least a bit hilly. In many communities, the cemetery is positioned above the town, on the outskirts, overlooking the townsfolk, and this makes a lot of sense to me. I made the in town cemetery in Apparition on a hill for this reason, even though it’s a cemetery from my imagination and not based on any specific one. 2. The best cemeteries have landscaping. Flowers and shrubs are good, but trees are what make a cemetery really special. The bigger, the better. Some of my favourite cemeteries are actually a little overgrown. One of the best cemeteries on the planet is in London, England, the Abney Park Cemetery. It’s ancient and overrun so you almost have to search for the gravestones amongst the trees and brambles and ivy vines. It’s spooky as hell, even in daylight. 3. Then there are the shapes and ages of the actual gravestones, from tiny markers on the ground for babies to ostentatious monuments for wealthy families in town. I also like the statues, especially of angels. Sometimes there are little shrines with home-made icons and candles for a more personal touch. 4. The age of the cemetery makes a big difference to its character, and whether the inscriptions are sharply etched, or worn and crusty beyond all reading. The best cemeteries are the old ones that are still in use. My favourite are at least a hundred years old. The inscriptions tend to be more poetic and religious with age, often with scriptural references few people would recognize today. 5. Cemeteries are communities. In any given cemetery, who are the dead? The graveyard just up the road from my country home is filled with Scottish immigrants, born in Scotland and died over here. Another nearby cemetery is in Leith, with a gravestone that marks the final resting place of famous Canadian painter Tom Thomson, although whether the bones disinterred from Algonquin Park near where he drowned are really his has been debated for decades. Certainly his ghost prefers hanging out in the landscape he painted. 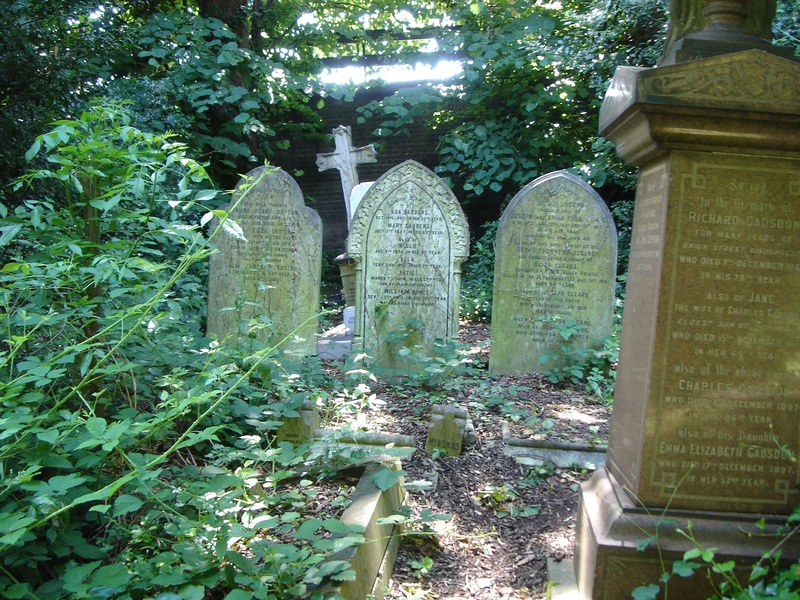 And the very Victorian Abney Park Cemetery in north London was designated specifically for citizens who were not members of the Church of England, ie not Anglican. In the 19th century, that meant outsiders of one form or another, self-proclaimed atheists, Salvation Army members, ‘free thinkers’ of all sorts. 6. You can read quite a lot between the lines on a gravestone, just looking at the names and birth and death dates. Gravestones are often about relationships – somebody’s son, somebody’s wife. You can imagine their stories. What are the social demographics? In the early part of last century, the number of deaths of young women during childbearing years speaks volumes about the age-old risks in childbirth. Same with the spike in the deaths of babies in hard times. The deaths of octogenarians, all from the same family tree always impresses me. Then there are the war monuments, honouring soldiers whose bodies made it home. And I remember visiting a certain Inuit cemetery on the Baker Lake reserve in the high Arctic, a tiny community with gravestones marking too many deaths of teenage boys and young men, lost to suicide or misadventure. Walking though that cemetery, the feeling of heartache was practically unbearable.